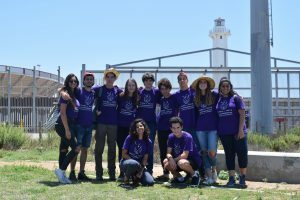 A group of high school students from Israel and Palestine visited Border Field State Park in an effort to create common ground and peaceful relationships. As part of the Hands of Peace summer program, students from these two conflicting nations came together in a three-week trip to the San Diego region, where they engaged in numerous talks and activities which pertain to social subjects, the relationship between their home nations, and creating intrapersonal connections. The summer program is often the first time many of the participants — some of which have been personally affected by the armed dispute between these countries — meet someone from the other involved nation. Hands of Peace site director Sarah Heirendt says that the group of students is very unique and interested in international affairs. 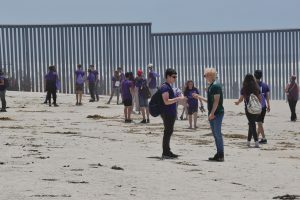 As part of this daytrip, the visiting group got to see the border wall which divides the Playas neighborhood of Tijuana, Mexico from the southwest corner of Imperial Beach, California. Although the students saw Mexico for the first time, this was not the first time many see a wall or barrier separate two countries, as Israel has also constructed barriers along its borders with the West Bank and the Gaza Strip, as well as Egypt, Lebanon, and Syria. “Many Israelis and Palestinians have only seen their version of the border, so for them to come to the U.S. for the first time and to see the border wall between the U.S. and Mexico is an eye opening experience and it is perspective shifting as well,” Heirendt said. Omar, whose grandfather was born in the city of Yaffa prior to Israeli occupation, is a Palestinian student participating in the summer program. He shared that looking at the dividing wall game him a familiar, poignant feeling. “It is hard to look at the border dividing Mexico and the United States because I really want to go across into Mexico and see how they live there and hear their personal stories and I have the same feeling when I look at the border between Israel and Palestine,” he shared. After their initial sighting of the border, the group took 30 minutes to go down to the beach, take pictures, and mingle. This was followed by scheduled icebreaker activities among group members, interactions with students from Tijuana’s CETyS University, and their facilitator-lead daily discussion. As part of these discussions, students engage in an organized, respectful manner through some basic ground rules and making space for all to have a voice. Heirendt says that the discussions are a unique venue for these students as they do not have many places to talk about subjects such as conflict, cultural differences, gender roles, and how all of these impact them both personally and as a group. “These teens are so mature for their age and work very well with one another. They have learned skills such as communication, active listening reflective listening, and what they want to take home from this program as leaders and peacebuilders in their community,” Heirendt stated. As part of the Hands of Peace summer program, participants stay with host families, giving them a taste of daily life in the San Diego area. Other activities scheduled for the 2018 trip include painting a mural in the Oceanside area and serving food to homeless individuals.